The peach, Prunus persica, is closely related to apricots, cherries and plums. It was introduced into England in the early sixteenth century via Europe and Persia from China. The nectarine is a natural sport of the peach with smaller, more delicately flavored fruits, which are smooth-skinned, whereas peaches have a rough skin. Bush peaches are hardy in southern England and within the hardiness climate of zone 7; the protection of a south or south-west wall is needed further north. Nectarines invariably are grown on walls. Both fruits need abundant sunshine and crop to perfection under glass. A well-drained, deep, medium loam soil gives the best results. Soils with a high lime content are disliked; but acid soils should be dressed with mortar rubble. An application of 0.25kg (2 1/2 lb) per sq m (sq yd) of coarse bonemeal should be given at planting time and an annual summer feed of a balanced fertilizer at the rate of 112kg (4oz) per sq m (sq yd) should be applied. Give the trees a spring mulch of decayed dung if the material is available. Plant one to three year-old trees between mid-October and mid-March, preferably in October or November. Trim any damaged roots, cover them with no more than 10-16cm (4-6in) of soil, tread firm and ensure that the graft union is above ground. Keep the trunks of wall trees 10cm (4in) away from the walls. Fan trees should be tied temporarily until the soil has settled, bush trees should be staked, putting the stake in the planting hole before the tree. Planting distances are: for fan trees 5m (15ft) apart, and for bush trees 5-7m (15-20ft). 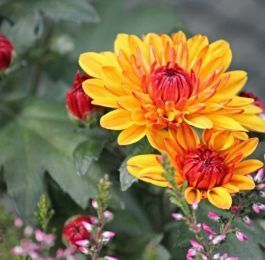 Mulch either with compost or strawy manure in March, and rub off the first season’s blossom buds. Frosty sites are unsuitable as the trees flower in February or early March, and wall trees should be protected with hessian or tiffany at night, though this should be removed by day to allow pollinating insects access to the flowers. Although both fruits are self-fertile, hand pollination ensures a full set. Fan trees, however, often set an excessive crop, and the fruitlets should be thinned progressively so as to leave peaches at one per 10 sq dc (1 sq ft) and nectarines at one per 23cm (9in) square. Give copious waterings while the fruits are swelling. Leave the crop to ripen fully on the tree, and check daily for ripe fruits by palming off—finger pressure causes bruises. They should be used promptly, for dessert, bottling, canning or jam making. When pruning it should be remembered that peaches and nectarines fruit on the previous season’s shoots, so prune them hard enough to induce plenty of new growth, at least 30cm (12in) in length annually. However, do not go to the other extreme as excessive pruning induces lush growth and diminished cropping. Cut out any dead wood, crossing branches and a third of the old growth of bush trees in May, cutting always at a strong sideshoot. Disbud the fruiting shoots of fan-trained trees during April, May and June, retaining one new shoot at the base, tip and middle. Pinch out the growing tips of the last two at five leaves, but allow the basal shoots to grow to their full length. Cut out the fruited shoots after harvest and tie in the replacements in fan formation at 8cm (3in) apart. Over-vigorous trees should be root pruned. Trees are easily raised from seed but do not come true. Named varieties are Chretien on to seedling peach or plum rootstocks in July or early August. Plum rootstocks are best for heavy soils—’St Julien’ gives medium-sized trees; ‘Common Mussel’ the smallest, coupled with early fruiting, and ‘Brompton’ the largest. Seedling peach rootstocks sucker less than plum rootstocks. 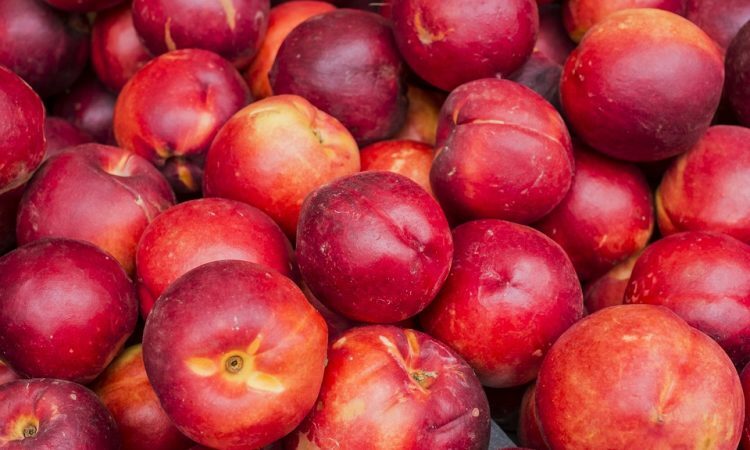 Peaches and nectarines are prone to being infected by many diseases.